It's mutiny on the high seas in this light-hearted lesson in playing well with others. When Salty Jack pretends his bedroom is a pirate ship, his friends help him tie ropes to serve as rigging and sheets to serve as sails. Crew mates Scallywag Sanjay and Barnacle Bob hoist the sails, and soon the friends are cruising past flying fish and secret caves. But their daring adventure goes to the dogs when Captain Salty Jack barks out too many orders and Millie the Mermaid abandons ship, setting an example for the rest of the crew. When Jack discovers it's not as much fun playing alone, he must figure out a way to get his friends back. 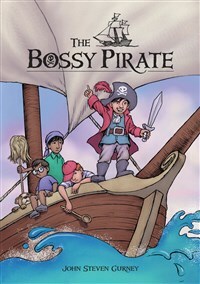 Children will discover, along with Captain Jack, that an adventure can be even more thrilling when everyone is allowed to share their creative ideas, and even steer the ship. John Steven Gurney is the author and illustrator of the graphic novel Fuzzy Baseball and the picture book Dinosaur Train. He is the illustrator of the A to Z Mysteries and lives in Brattleboro, Vermont.